Building relationships is at the heart of everything Ingrid Bruce does. Whether creating and maintaining a citywide enterprise GIS or meeting with refugees in Germany to show them support, Bruce believes that making meaningful connections with people is essential. "That's why we have been able to progress as far as we have," said Bruce of the City of Rancho Cucamonga, where she is deputy director of the Department of Innovation and Technology. The city initially hired her on December 1, 1986, to do GIS. Rancho Cucamonga was burgeoning, so the city had invested in the fledgling technology to manage development. "Lots of homes [were] being built," said Bruce. "Their main thing was keeping up with the amount of parcels that were being created." Bruce had never used GIS before, but she had a background in land surveying and cartography. Originally from Guyana, Bruce studied cartography in a government program for high school graduates. The South American nation didn't have any universities at the time, so this was a continuing education program. In it, she explored architectural and structural engineering mapping. But it wasn't until she got to cartography that mapping really piqued her interest. She was given a 36-by-24-inch piece of paper and a novel; she had to draw leader lines by hand and transcribe the text from the book. It turned out, she had the outstanding penmanship the government was looking for in cartographers, so she was encouraged to stick with the vocation. "Once I started to learn about it all and go out in the field and…use the instruments for surveying, I was hooked," she said. She worked for Guyana's Ministry of Public Works and Communications in its cartography and hydrographic departments before moving to Southern California, where she was suddenly a single mom looking for work and trying to raise her daughter in a new country. "Going back to school full-time to get a degree was out of the question," she said. So after she got the job at the City of Rancho Cucamonga, she would take classes here and there to help advance her skills. She even took a course at Pasadena City College to prove that she knew what she was talking about when it came to cartography. She did. And during this time, when technological trailblazers were still fighting to use computers in the workplace, Bruce also understood how groundbreaking GIS was and how it could guide city planning in ways that weren't possible before. "She, among other people [who] were in that early phase, saw a vision of what the technology can do, and they tried to move that vision forward," said Chris Thomas, Esri's global manager for government activities, who was managing GIS for the neighboring City of Ontario when Bruce was starting out. "She never gave up. She just kept moving that needle forward." When Bruce began at Rancho Cucamonga, the city was in the midst of an unprecedented growth spurt that had started in the 1970s. But because of a California law that capped property tax increases and limited reassessments, the booming city wasn't making enough tax revenue to cover all the needed infrastructure and community services. So Rancho Cucamonga created special districts—areas in which the city sold bonds to raise the funds to build infrastructure, such as streetlights and parks. Each parcel in a special district is assessed every year and taxed accordingly to repay bondholders. As Bruce pointed out, "it was a perfect marriage to use GIS to manage special districts," which was what she did, because a large part of Rancho Cucamonga's tax revenue was tied directly to parcel data, which is inherently spatial. But what really calcified the principal role of GIS in Rancho Cucamonga was when the community development director, Jack Lam, became city manager in 1989. He also understood the importance of GIS for development, and when he took the helm of administering the entire city, he kept GIS under his wing. That meant that, while the GIS department worked with other facets of the city, such as the fire and police departments, it reported only to the city manager. "That was the start of us creating the enterprise GIS that we have for the city," said Bruce. "We were doing enterprise GIS before 'enterprise GIS' became [a] buzzword." GIS was later moved to the Administrative Services Department, which internally supports all departments within the city. This helped cement the identity of Bruce's team. Additionally, the love of GIS demonstrated by Rancho Cucamonga's current city manager, John Gillison, launched the technology to the stature it has attained within the City of Rancho Cucamonga. "That has been really what has propelled us forward into the GIS that we have right now," said Bruce. While that is true, Thomas wants to make sure Bruce gets the credit she deserves for broadening the use of GIS. "We have to acknowledge that it wasn't just the organization that was behind it, it was an individual," he pointed out. 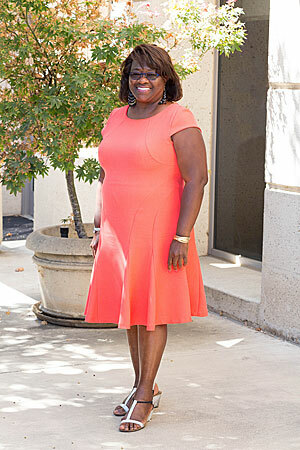 "That individual that's been a constant in Rancho Cucamonga's GIS history is Ingrid Bruce." According to Thomas, who worked in close collaboration with Bruce for years, she always found new ways to use the technology and consistently shared her city's spatial data. "She played the part of any pioneer, which is to make sure others understood the value of what we were doing," said Thomas. Bruce did that by fostering creativity and connections. "We have the freedom to think and come up with new ideas and push the technology in new ways that have allowed us to flourish," said Solomon Nimako, the GIS supervisor at the City of Rancho Cucamonga. "We have very strong relationships with every department. […] We can take our ideas to them and they're willing to learn and understand." Nimako hopes that when Bruce retires this year—30 years to the day after taking up her post at the City of Rancho Cucamonga—the department can continue executing Bruce's philosophy of relationship building both internally and externally. Which is essentially what Bruce will do in her retirement, just in a different capacity. Following on one of her recent mission trips in which she traveled to Germany and met with refugees from all over world to encourage them, she plans to work with a new ministry at her church geared toward refugees. She will also increase the lay counseling she provides to women and looks forward to spending more time with her daughter, whom she put through college, and grandchildren. She is proud of her time at the City of Rancho Cucamonga. "Not having the degrees, the letters behind my name that the world says I'm supposed to have, and to be able to accomplish what I have is very humbling," she concluded. Now the question is, who takes up the reins of this pioneer?